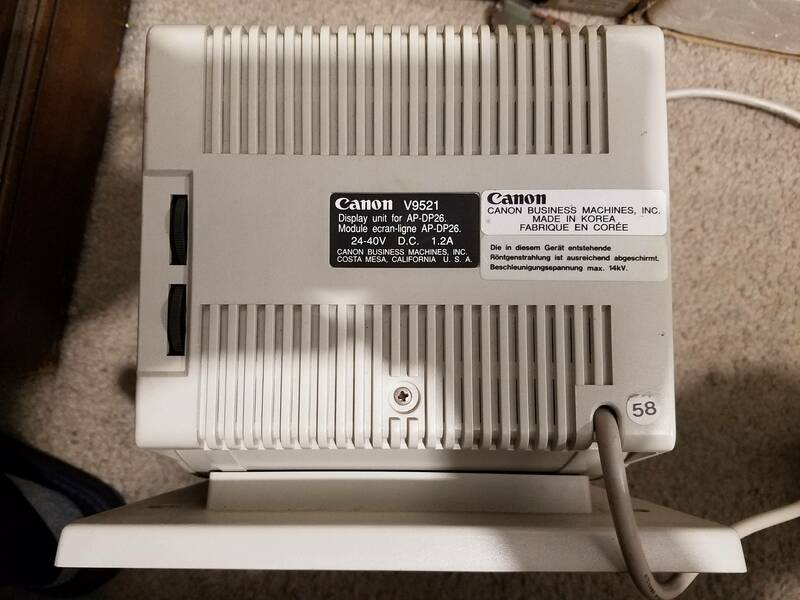 I bought a vintage Canon monitor off a friend which I'd like to interface with and use as a cool retro monitor. The problem is that I can't find anything useful about this monitor after days of searching on Google and my friend can't help me with it. The monitor is a Canon v9521 which I suspect is a monochrome unit because of the low power that is needed. 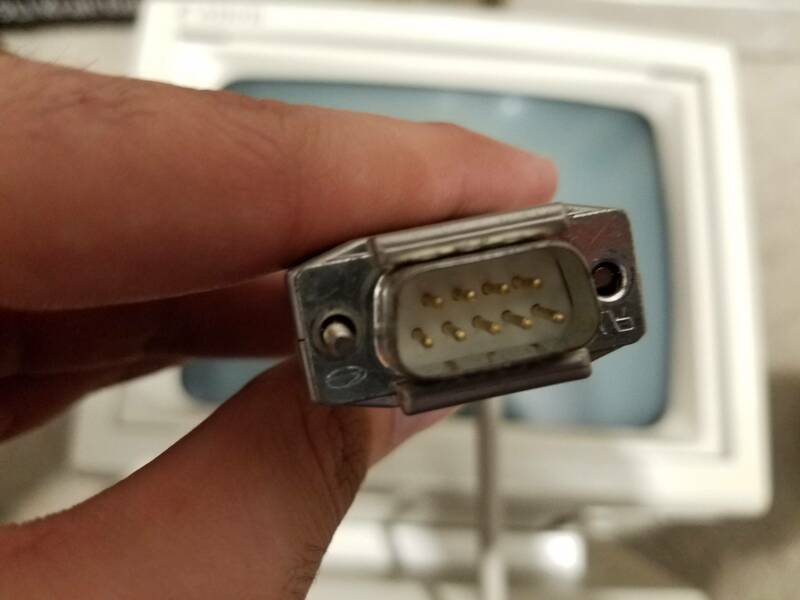 It also only has one cable coming out of it, a standard DB-9 male cable, with no evidence of a connector for power (it's probably powered from the DB-9). This monitor is for a Canon v3101a or v3102 electric typewriter(?). I need to know the pinout of the DB-9 cable so that I can power up the monitor and hook it up. I also need to know the protocol that this uses so that I can actually program an Arduino to interface with it. I ended up going with Ken Gober's suggestion of opening the monitor and tracing the pins. There were 2 circuit boards for power and signals like he suggested there might be. I got the monitor powered up and played with signals using an Arduino. The monitor has a refresh rate of 60 Hz but it seemed to scan the whole screen without requiring input to the HS & VS pins. Here is the pin diagram that I extracted. The labels are from the board that the signal pins went to. So I'll assume the VS and HS are vertical and horizontal sync. VD is the video input, but no intensity, just on/off. I have no idea what HF might be. The - pin with the ? might be unconnected or part of the minus volt pins, it had a slightly higher resistance than the minus pins. What voltage does the monitor require, is it AC or DC, and how much current? Which pin(s) are power, and which pin(s) are ground. Standard warnings about opening CRTs apply. Always assume that there are potentially life-threatening voltages in a CRT regardless of how long it has been powered off. Once you've got those answers, you can experiment to discover the other pin assignments. The sticker on the back says 24-40V DC 1.2A, which answers the first question. Figuring out the second one is what will probably require you to open the thing up. The individual wires in the cable will probably lead to one or two small circuit boards. If two, one board will probably be for data signals and the other board will probably be for power. If one, hopefully power and data are on distinct parts of the board. You may need to use a volt/ohm meter (preferably one with a continuity test feature) to identify which pins connect to which parts of the board. Sidebar: If you have the thing open anyway, your best bet may be to reroute the power connections to a new jack that you install. Probably a barrel jack, but your exact choice should be dictated by what kind of replacement power supply you can come up with. A 24VDC 1.2A power supply shouldn't be hard to find, such things are commonly used to power laptops, consumer routers and various small electronics. The important thing is to find one that can supply 1.2A (finding something that can meet the 1.2A requirement will probably be harder than finding something that can meet the 24-40 VDC requirement). If you do this, and you are going to experiment to figure out the data pin assignments, then I advise disconnecting the +24V pins in the cable, so that you don't accidentally burn something out later, e.g. if by accident a pin carrying +24V touches one that's designed for only +5V (or even worse, one that's designed for 0.7V). Analog output from a VGA card (again, using the green pin). There will be a lot of trial-and-error here unless you are very good at figuring out what a circuit does by looking at a board (and if you're that good you don't need any advice from me). Once you've identified which wire carries the video signal the final step is to work out the scan frequency and refresh rate (and which pins are used for horizontal and vertical sync). Hopefully the monitor uses separate pins for HSYNC and VSYNC, and uses standard scan/refresh rates because if it's non-standard it can be very hard to work out what the 'design' rate is (and driving a monitor at the wrong rate for too long can damage it). The fact that it doesn't have a power connector is bizarre. I use the word advisedly, because I didn't think that the DE-9 (I'm being pedantic - that's what they're actually called) could handle the sort of amperage that such a display would need. There are (barely) sufficient "reserved" connectors to allow it though. Not the answer you're looking for? Browse other questions tagged display terminal crt-monitor canon or ask your own question. Atari 800XL, black screen on power on - how to diagnose the problem?